When it comes to fitting and configuring your new Shade Sail, Shady Places provides several high quality installation options. Our tradesmen have been purpose trained to install your sail with utmost care and professionalism. 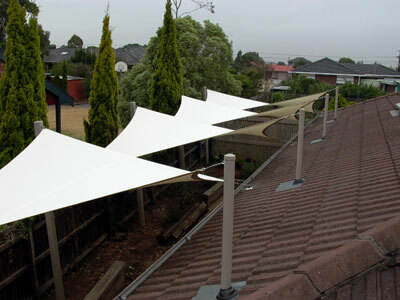 Where suitable, Shade Sails can be attached to your building or house using metal plates, which are directly attached to brick wall corners (suitable for smaller structures). Eyebolts through the fascia allow cables to be attached to the roof structure and roof posts. This type of fitting can create extra height and enhance the number of design possibilities. 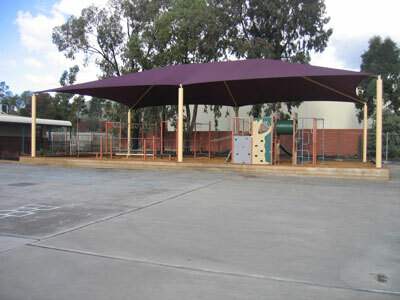 Canopy-style shade structures are ideal for childcare centers and kindergartens when placed over play equipment, sand pits and open areas. 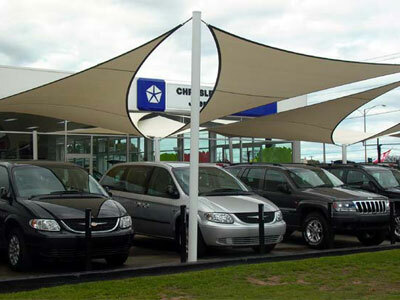 These structures can span verry large areas and offer maximum shade, with the perimeter kept quite low, while the centre frame can be set high to create clearance for obstacles. 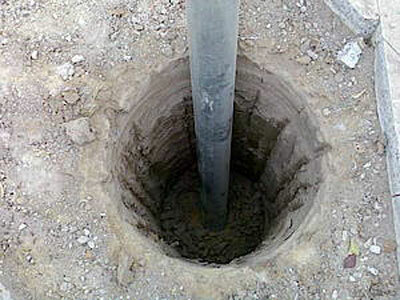 Where required Shady Places can provide and install square 100x100mm poles, and round poles up to 165mm diameter. Both come with knock on caps as standard. Larger commercial jobs may require poles as large as 300mm in diameter. These poles are hot-dipped galvanized and can be powder-coated in a wide range of colours. All poles are concreted up to 2mx610mm diameter into the ground using M25 strength concrete and counter levered at 5 to 10 degree angles.